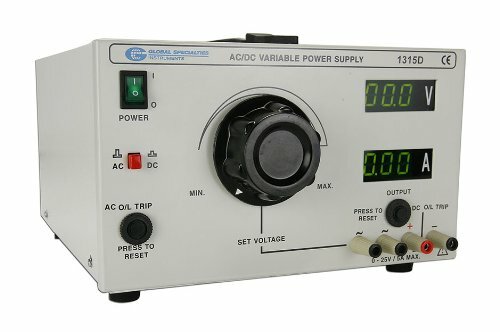 This Global Specialties 1315D power supply provides dual variable 0 – 25V AC and DC outputs (+/- 2 V accuracy) at 5 amps and has separate AC and DC push-to-reset circuit breakers for protection. Four Broadband Terminal Interface (BTI) terminals provide for quick circuit connection and two 3-digit LED displays show voltage and current independently. This power supply is Conformité Européenne (CE) certified for quality assurance, and is suitable for circuit testing applications. If you have any questions about this product by Global Specialties, contact us by completing and submitting the form below. If you are looking for a specif part number, please include it with your message.